At the height of summer comes a special time when Americans join together to celebrate our nation’s freedom and to pause and reflect on the sacrifices military personnel and their families make every day. Always held July 4th, the Spirit of America Festival attracts thousands of families to Point Mallard Park in Decatur for some free star-spangled fun, awards, music, and games. Festival organizers are pleased to announce this year’s festival has been named a top 20 event in the southeastern United States. This year’s Spirit of America Festival has been named a Top 20 event for July by the Southeast Tourism Society (STS), a non-profit organization dedicated to the promotion and development of tourism to its 12 member states of Alabama, Arkansas, Florida, Georgia, Kentucky, Louisiana, Mississippi, North Carolina, South Carolina, Tennessee, Virginia, and West Virginia. Through a nomination process, STS chooses the Top 20 events in the Southeast for each month of the year and publishes the list of winners quarterly. The Top 20 Events publication is distributed to over 1,600 newspapers, magazines, radio stations, TV stations, AAA publications and others. Decatur’s free Independence Day celebration kicks off at 4 p.m. with the Children’s Bike Parade where patriotic decorated bikes, tricycles, wagons, strollers, and four wheels make their way from the TC Almon Center to the Honda Children’s Area. There is no fee to participate in the Bike Parade; however, registration is required beginning at 3 p.m. First, second, and third place prizes will be presented during an awards ceremony beginning at 5 p.m. on the Children’s Stage. Other activities include entertainment from Bill Crosby, karate demonstrations, face painting, balloon crafting, and inflatables in the children’s area, a hula hoop contest for children 5 to 12 years old, the Ping Pong Ball Drop for children up to 12 years old, and a Money in the Hay contest for children up to 8 years old. Live music will also fire up the crowd in between the star-spangled activities. Slated to perform on the Auxiliary Stage are bluegrass band Grassy Divide at 4 p.m. followed by vocalist Taylor McLain from 5 to 6:30 p.m.
At 7 p.m., the Children’s Area closes and festival goers can make their way to the Spirit of America Stage for the Spirit of America Award Show, a presentation of awards recognizing outstanding service and sacrifice for country and fellow man, and the Miss Point Mallard Pageant, a preliminary for the Miss America Pageant. More than just a fireworks celebration on the 4th of July, an awards program was developed to pay honor to the true meaning of the day. Named in honor of America’s most decorated soldier and Congressional Medal of Honor recipient Audie Murphy, the Audie Murphy Patriotism Award is presented to an outstanding American patriot or an outstanding group of individuals who best exemplify the true “Spirit of America.” This year’s Audie Murphy Patriotism award is presented posthumously to Lieutenant Colonel Elliott Cecil Chandler, for his heroic actions and leadership abilities during the Korean War. The Barrett C. Shelton Sr., Freedom Award was established in 1980 in honor of local newspaper publisher Barrett C. Shelton, Sr., one of the founders of the Spirit of America Festival. The award is presented to honor an Alabamian for outstanding service to his community. The Spirit of America Festival Committee presents the Shelton Freedom Award posthumously to the family of Earl Claxton Warren, who bravely served his country and is known as “the Teenager at Pointe du Hoc” and later made significant contributions to his community and state. Added in 1994, the Humanitarian Award is presented to an individual, group or organization whose efforts have significantly contributed to the betterment of life, health and welfare of mankind and state. This year’s recipient is Miss Anna Laura Bryan, Miss Alabama 2012 and a top 12 finalist in the Miss America pageant, for her platform work with P.A.W.S. for Autism: People and Animals Working Side by Side. In 2011, the Spirit of America Festival Board of Directors introduced a new award named in honor of its first recipients, the CSM John and Brenda Perry Award for Support for Military Families to recognize the significant contributions, suffering and deprivation that military families endure, all in the support of their family members who serve in our nation’s Armed Forces. The award is to be presented to that person, group or organization that has significantly supported military families. This year’s recipient is the Patriot Guard Riders, a group who understands the theme of the 2013 festival, “Freedom Is Not Free”, and whose motto is “Standing for those who stood for us.” The Patriot Guard Riders is a diverse amalgamation of riders from across the United States with one thing in common besides motorcycles. Members have an unwavering respect for those who risk their lives for America’s freedom and security. Following the crowning of the new Miss Point Mallard, the celebration culminates at 10 p.m. with a spectacular fireworks display. Freedom Is Not Free is the theme of the 2013 Spirit of America Fireworks display, one of the largest free fireworks exhibitions in the region. 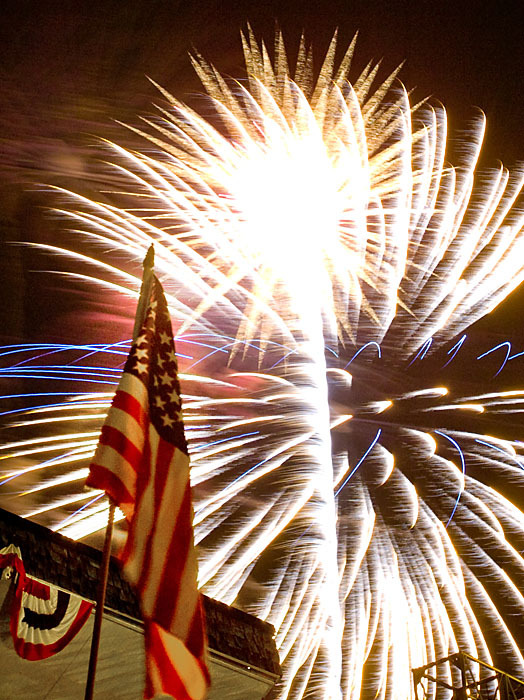 The fireworks display begins at 10 p.m. and a live simulcast will be offered by the Festival’s media partner, Clear Channel Communications and can be heard on WDRM 102.1 and 100.3 The River. Two additional activities leading up to the festival are the Little Miss Point Mallard Pageant at the TC Almon Recreation Center on July 2nd and the Miss Point Mallard Outstanding Teen Pageant on July 3rd on the Spirit of America Stage. Both pageants begin at 7 p.m.
All activities take place in Point Mallard Park located at 2901 Point Mallard Drive in Decatur unless otherwise noted. Admission to the festival is free; however, some children’s activities require the purchase of tickets for a nominal fee. For more information, including a schedule of events, visit www.spiritofamericafestival.com and click on “Schedule” or visit its Facebook page. The Old State Bank was restored to its original grandeur in the early 1980s by the City of Decatur, Alabama. The Old State Bank hosts inside tours for about 7,000 visitors annually and more than 10,000 guests enjoy its grounds each year. Located next to Alabama Highway 20, the Bank is seen by occupants of about 35,000 cars daily. The Bank is a favorite scene for family, wedding, prom and senior class portraits. It is also a preferred venue for weddings, receptions and many public events. Its garden area in the rear of the Bank consists of a large brick patio, a grassy lawn area and a garden with a small arbor and benches. It has been thirty years since the lawn and garden were restored; therefore the grassy lawn area and garden area are in serious need of renovation including completely rebuilding the benches and arbor. The concept for the renovation has been developed by retired Judge David Breland, now the Director of Historic Resources for the City of Decatur, Philda Starks, Garden Manager of Lowe’s of Decatur and Sam Barnett, a certified landscape architect with Godwin, Barnett and Woods in Decatur. The lawn and garden design will feature plant species which would have been found in Southern gardens prior to the beginning of the Civil War in 1861. These trees, shrubs, vines and perennial and annual flowers selected needed to be fragrant as well as visually beautiful. Judge Breland and Ms. Starks also provided valuable research as to which plants qualified for inclusion and Mr. Barnett designed the placement of the plants and other garden features. The benches and arbor were also to reflect correct architecture of the time period. The project is also the Eagle Scout project for Joey Baker, son of Craig and Melinda Baker. Mr. Joey Baker of Decatur will provide overall leadership for the project as well as labor from Troop 260 of the Boy Scouts of America. Since Mr. Baker is an excellent leader and Troop 260 is a very large and active scout troop with a proven record of successful scout Eagle projects, we anticipate that 25 or more young men, parents and community friends of the troop will participate in the project. BRIEF HISTORY: The Old State Bank (1833) is Decatur's second oldest building, having been built seven years after the first lot was sold which established the town of Decatur. It is the oldest bank building in the state of Alabama. 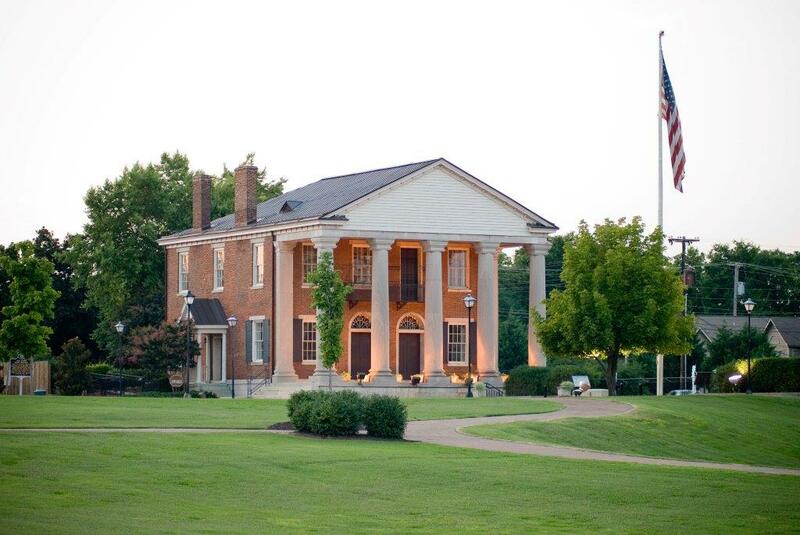 Founders Park is actually a portion of the front yard of the Bank. An iconic building, it is considered the very symbol of the city itself. Its directors were responsible for the financing and building of the first railroad located west of the Allegheny Mountains which ran from Decatur to Tuscumbia. Its long and rich history includes major Civil War action which left numerous bullet and cannon mortar scars in the columns of the bank. Its 5 column Jeffersonian design is unique in Alabama architecture. A grant of $2,000 was received from Lowe’s in addition to their pledge of volunteer assistance, plants and lumber; a $1,000 anonymous donation was received plus many additional donors chipped in totaling over $4,000 in contributions to accomplish the mission to complete the Southern Heirloom Fragrance Garden at the Old State Bank. Volunteers may arrive at the Old State Bank ready to work at 8:00 a.m. on Wednesday, June 26th. You may bring tools or gardening gloves if preferred. JARC will host Decatur’s first lacrosse tournament in 2013. For the past seven years, the Jack Allen Recreation Complex has hosted local, regional, and national soccer tournaments attracting thousands of amateur and professional players and earning a reputation as a world class facility nationally and internationally. In 2013, the complex welcomes its first lacrosse tournament where as many as 75 teams from across the southeastern United States will travel to Decatur for the River City Rivalry. Teams from Alabama, Georgia, Florida, Kentucky, Louisiana, South Carolina, and Tennessee are expected. The tournament features full field format with a guaranteed four game minimum play (weather permitting). Each game will consist of two 20 minute halves. Day one will feature “round robin” pool play and day two will be single elimination tournament/consolation play. The tournament is open to the public. “We encourage everyone to come and see firsthand the excitement a lacrosse game brings and to learn more about this growing sport,” added Morris. Admission is free. Parking is $10 per day or $15 for both days. All games will be played at the Jack Allen Recreation Complex located at 2616 Modaus Road SW in Decatur. For more information on the facility, visit www.decatursports.com. For more information on the River City Rivalry tournament, contact McNabb or Johnson at 770.940.3812. 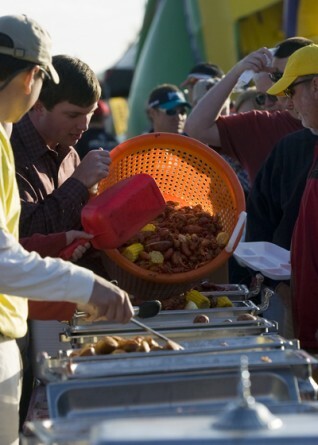 Annual Cajunfest returns to Ingalls Harbor June 14th. It’s ragin’ Cajun time at Ingalls Harbor in Decatur, Ala. Set for June 14th along the banks of the Tennessee River, Cajunfest, featuring an authentic Cajun meal and live zydeco and Cajun music, allows party goers to experience a bit of Louisiana while serving as a fundraiser for the local chapter of the American Red Cross. Hosted by the American Red Cross Morgan-Lawrence Chapter, Cajunfest gets started at 5 p.m. and lasts until 9 p.m. Authentic Cajun food will be freshly prepared and served by Roland’s Cajun Catering and includes a serving of crawfish, shrimp, potatoes, corn, chicken and sausage jambalaya and two drinks (Pepsi and Budweiser products). The shrimp and crawfish will be seasoned with all of the Louisiana traditions of fresh garlic, lemons, onions and other spices. A limited number of tickets are available now until June 7th and may be purchased at the Red Cross office located at 431 Holly Street, NE in Decatur. Office hours are Monday-Thursday 8:30 a.m. to 4:30 p.m. and Friday 8 a.m. to 1 p.m. Tickets are $25 each and will not be sold on the night of the event. Sponsored by BP, Joe Wheeler EMC, Housing Investors, Inc., Valley Budweiser, Air Products, Progress Bank and Trust, Bank Independent, and Pepsi Cola of Decatur, proceeds from Cajunfest benefit the Morgan-Lawrence Chapter of the American Red Cross. Ingalls Harbor is located at 802 Wilson Street NW in Decatur. For more information on Cajunfest, call Beth Tutwiler at 256.353.4891.